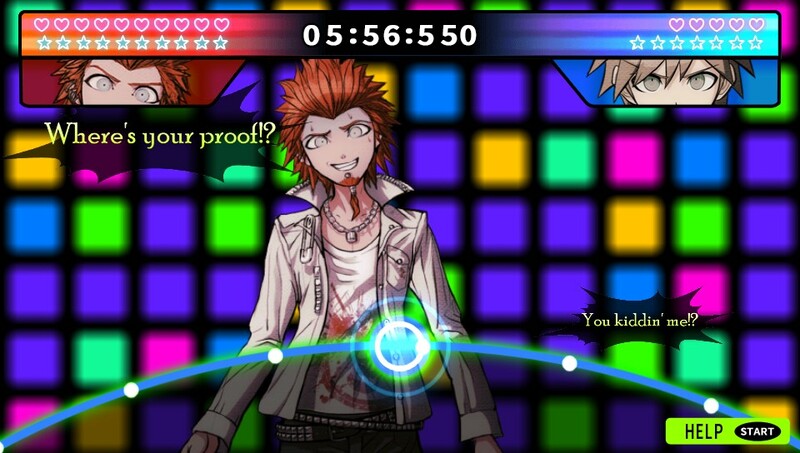 Danganronpa: Trigger Happy Havoc is mystery adventure game that offers players an “ultimate” experience. When playing any type of mystery game, I like to go into it completely open-minded. I am exactly who mystery games (movies, books, etc.) are made for! I want to be shocked and awed. I want the surprises, and I won’t try to figure out what’s going on ahead of time. Sure, I guess at a few things here and there, but for the most part I like to let the story take over and evolve as it should. 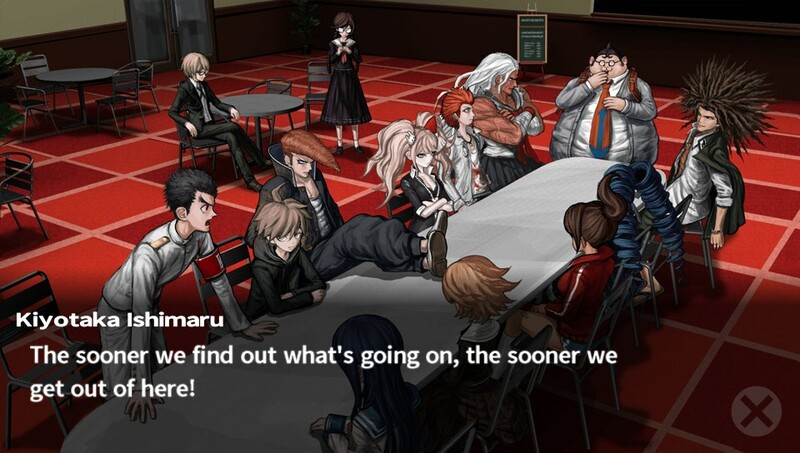 That is how I went into Danganronpa and I am very grateful that I did. I experienced many !!wow!! moments along the way and I hope that you will as well. Take note that this title is rated Mature, and for good reason. This game is not for kids nor the faint of heart. OK, that might be a bit extreme, but if you truly let yourself get immersed in this game, there will be a few chilling moments along the way. The story is fantastic, and considering this is a story-driven game I would hope for no less. You enter a high school, an “ultimate” school where only “ultimate” people are admitted. Notice the trend? Good. Except you are not ultimate! Sorry, but you’re not. You are lucky! You were picked at random to join this school. Oh well, make the best of it, learn what you can and go on about your life! Except that the “best of it” in this situation isn’t too grand. You get here and things start to go crazy. Monokuma, this crazy robotic bear, shows up and claims he is the headmaster. Oh, and by the way… you are stuck here forever! <cue evil/maniacal music> The only way to graduate and earn the privilege of being able to leave the school is to commit murder. Kill someone- a classmate, to be more specific. You also have to get away with it. No one can know that you are the killer. There will be a trial to decide if you have gotten away with it or if you are busted. There are also plenty of school rules you have to follow along the way. Welcome to school, doods! As you run around learning the rules, getting to know everyone and generally trying to get the hell out of this school, the threat of murder looms in the background. It’s your only way out. You know it’s coming, the question isn’t if it will happen- instead it’s who will it happen to? When things do go bad in a murderous way you get to play junior detective! Scour the crime scenes, see what evidence you can uncover and try to piece together exactly what happened. Once you have done that, you have to convince everyone else of what happened. As with any normal murder, there must be a trial! You need to know the facts of the case, have your clues worked out and be very aware of every detail. Just like a real trial I suppose. Everything up ’til this point had been so great and I figured this would be where things kicked into high gear as far as gameplay. I was right! Since no one will ever agree on what happened, it is up to you to make them see reason. You have to refute what some of the others are saying, using the clues you collected earlier. They will argue over everything! Things like the series of events leading up to this particular murder, the weapon used and much more. To refute your fellow classmates, you use truth bombs, which is a bit of “truth” that you “fire” at what your school mates are saying. Firing is done by aiming with the left stick and hitting triangle, or tapping the screen. I did have some minor annoyances as I was learning exactly what to do through each section of the trial, but in the end I became the “ultimate trial lawyer” (not a real thing). As you progress through the game, new challenges will be added to the trials that add to the fun and annoyance factor. A few things felt like they were tacked on just to have things be a bit more intense through the trials. You can see for yourself when you start playing! Some of the game will progress with you being automatically taken where you need to be. Other times you will need to explore a bit on your own. Pay attention to what is going on and you will know where to go most of the time without exploring each room in the school. There is even a map that you can overlay on your screen. I love this map! I’ve stated before that I get lost (embarrassingly) easy while gaming. I didn’t have that problem here, and yes, I would have been lost even in a school! In addition to that map, there is another that you can pull up in the menu. This one allows you to see the names of the rooms throughout the school as well as where your classmates are if you would like to seek them out during your free time. To explore the school use the left stick to look around. Press X, or touch the Vita screen to take a closer look at various objects. Some of these will be informational and some will trigger events depending on what’s going on at the time. With the ability to move the camera around seeing exactly what you want to check closer isn’t a problem. Moving the camera is as easy as hitting the D-pad whichever way you want to look.